The Developers or users may face a problem when they follow the step of the user manual try to Upload a sketch to the Dragino Lora gateway LG01-S or Upload Sketch to Lora shield board by using the newest version Arduino-1.8.5. the compiler will show: class RH_RF95′ has no member named ‘setSpreadingFactor’ or RH_RF95 Does not name a type. You may try many ways or search on the internet to find a way to solve the problems when the problems come.i have faced this problem and solved the problems successfully. 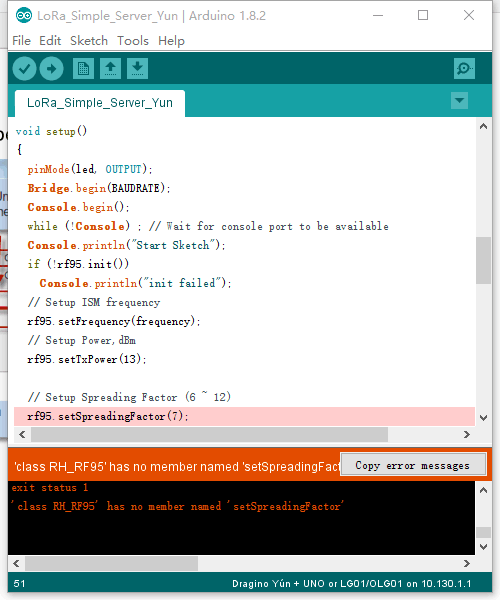 you may had used the old version Lora Library before like the version RadioHead-1.63 and add to the IDE as one library now the Dragino had been upgraded the newest version Lora library which is RadioHead-master the problems comes from the conflict between the old version and newest version Lora library(The newest version Lora library can be download from https://github.com/dragino/RadioHead/archive/master.zip). 3) Install the newest version Lora Library by using the Library Manager again. Then problem solved you can try it again. This entry was posted in Lora IOT and tagged arduino, IOT, LoRa, lora iot, RFM95W on May 8, 2018 by Ameisina. LoRa IoT Development Kit is designed to facilitate beginners and developers to quickly learn LoRa and IoT technology.The LoRa IoT kit will show how to build LoRa network, and how to use the network to send data from a LoRa sensor node to the cloud server. 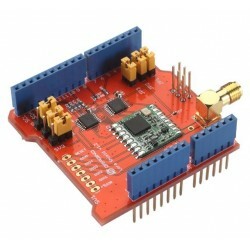 The Lora/GPS Arduino Shield is with 433MHz /868MHz /915MHz Versions is a expension board of LoRa™/GPS for use with the arduino.This product is intended for those interested in developing LoRa™/GPS solutions. 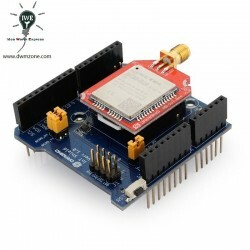 The 433MHz /868MHz /915MHz Arduino LoRa Shield is a long range transceiver on a Arduino shield form factor and based on Open source library.Compatible with Arduino Leonardo, Uno, Mega, DUE. LoRa Mini Dev is the easy prototyping board for LoRa Mini. It has a USB port which let user to easy program LoRa mini via Arduino IDE. it also has pin slot for easy to connect sensors. 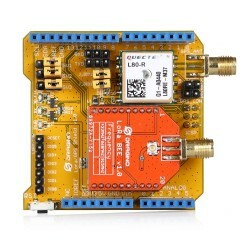 The Lora/GPS_HAT is an expension module for LoRaWan for using with the Raspberry Pi.This product is intended for those interested in developing LoRaWAN solutions which is based on the SX1276/SX1278 transceiver. NB-IoT Shield is an expansion board for Arduino to add NB-IoT technology. user can study/evaluate and do POC for NB-IoT solution rapidly. DWM-RAK811 LoRa Tracker board with GPS + MEMS Sensor is an open all source code products, uses the latest LoRaWAN1.0.2 protocol and supports LoRaWAN working mode, allowing users to conveniently link to the LoRaWAN network. LoRa Module for ESP32 DIY Development Kit Wireless 433MHz Built-in Antenna IOT Development Board. 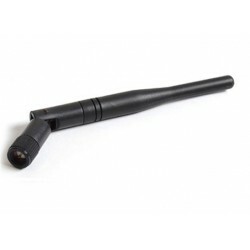 DWM-TLB-3.0QB SUB-1GHz / 2.4GHz Whip antenna with a Collapsible SMA male connectors.Which are available for 433MHz,868MHz.915MHz and 2.4GHz..
LoRa Antenna designed for Lora application which required for outdoor waterproof highgain and work at ISM free band like 433MHz /868MHz /915MHz SMA Male Whip antenna. This entry was posted in Lora IOT and tagged LoRa, lora development, lora iot, LoRa module, lora node on April 24, 2018 by Ameisina. Dwmzone is an online E-commerce Platform dedicated to Electronic Components distribution with Variety on offering and flexibility on the business model for small to Medium-size Enterprise as well as some professors or individual in the global market.We empower small business with the best resources from China including design, sourcing, manufacturing and shopping and shipping. If you need to buy or get things from the different suppliers or Aliexpress, Taobao online shop, we can offer you the service in China. This entry was posted in Shoping in HUAQIANGBEI and tagged shipping, shipping agent, shopping, Shopping agent on January 23, 2018 by Ameisina. 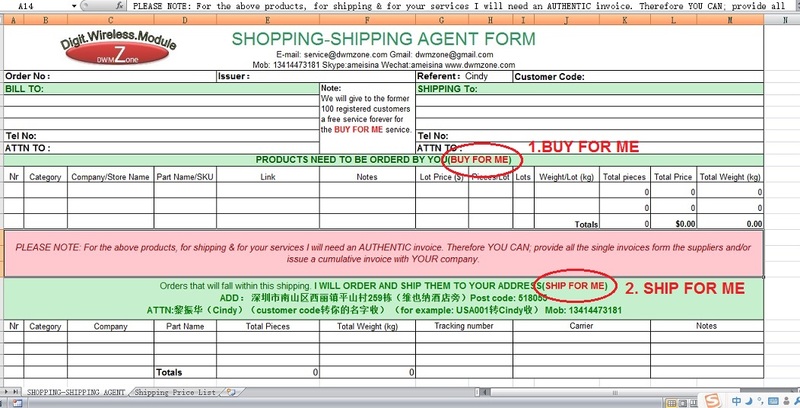 2.Download the Shopping-Shipping agent form. 3. 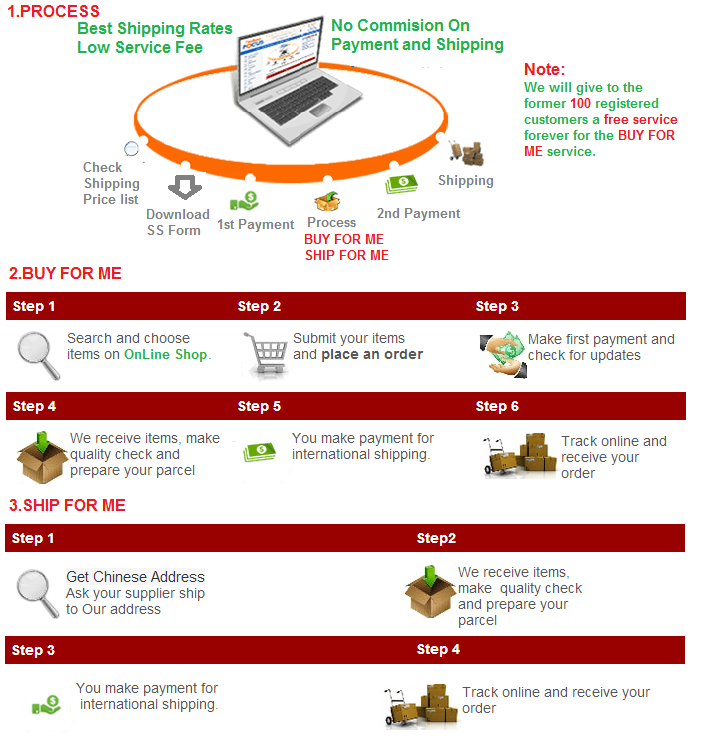 Open the downloaded Shopping-Shipping agent form. You will see There Two Services BUY FOR ME and SHIP FOR ME. 3. There are required information for delivery. Contact name, Delivery address, Phone number,Some country or region also need the Tax ID. 4. BUY FOR ME required information. 5. SHIP FOR ME Required Information. Must requre Your supplier Name, Part name and the total quantity. 6. After you fill the required information then you send the form back to us.we will check and confirm with you for more details. This entry was posted in Application, Service, Shoping in HUAQIANGBEI and tagged shoping, Shopping agent on December 19, 2017 by Ameisina. LSN50 is a Long Range LoRa Sensor Node. It is designed for outdoor use and powered by Li/SOCl2 battery for long term use power consumption and secure data transmission.It is designed to facilitate developers to quickly deploy industrial level LoRa and IoT solutions. It help users to turn the idea into a practical application and make the Internet of Things a reality. It is easy to program, create and connect your things everywhere. 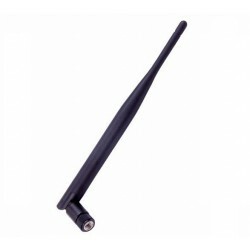 It is based on SX1276/SX1278 allows the user to send data and reach extremely long ranges at low data-rates.It provides ultra-long range spread spectrum communication and high interference immunity whilst minimising current consumption.It targets professional wireless sensor network applications such as irrigation systems, smart metering, smart cities, smartphone detection, building automation, and so on. LSN50 uses STM32l0x chip from ST, STML0x is the ultra-low-power STM32L072xx microcontrollers incorporate the connectivity power of the universal serial bus (USB 2.0 crystal-less) with the high-performance ARM® Cortex®-M0+ 32-bit RISC core operating at a 32 MHz frequency, a memory protection unit (MPU), high-speed embedded memories (192 Kbytes of Flash program memory, 6 Kbytes of data EEPROM and 20 Kbytes of RAM) plus an extensive range of enhanced I/Os and peripherals. LSN50 is an open source product, it is based on the STM32Cube HAL drivers and lots of libraries can be found in ST site for rapid development. 68 dB maximum link budget. The LSN50 is power off before shipping to avoid accident during shipping. We use a jumper to power on/off the LSN50, This will be useful for monitoring power consumption when connecting to different sensors and with different software. User can power on the device by simply adding the jumper to the board , as below. Input commands: Ex)AT+ADR=0（Adaptive rate is off）.If your AT command is sent successfully, the software will receive feedback (OK). Download Flashloader(Here is just sample application.You can also use the same type of programming application.And the method is similar.) and download STM32CubeExpansion_LRWAN.zip(Include source code). Follow the picture to find the program file. Remove the jumper from JP2, connect with a multimeter, and hit 20uA. The Oil Sensor is a sliding variable resistance, floating through the float above the circuit to change the size of the resistance. DS18B20 Temperature range is -55~125℃. The delay time when the temperature changes is 750ms.Temperature measurement error is 0.5 ℃. The programmable resolution is 9~12 bits. The DS18B20 is configured as 12 bits at factory shipment. When reading the temperature, a total of 16 bits are read. The first 5 bits are sign bits. When the current 5 bits are 1, the read temperature is negative. When the current 5 bits are 0, Take the temperature is positive. When the temperature is positive read method: the hexadecimal number can be converted into decimal. When the temperature is negative, the reading method is: add 1 after the hexadecimal inversion, and then convert it to 10 hexadecimal. Example: 0550H = +85 degrees, FC90H = -55 degrees. This entry was posted in Application, Lora IOT and tagged LoRa, lora end node, lora iot, lora node on December 8, 2017 by Ameisina.